The Wireless HD 3D Digital Kit (GW3DHDKIT) is a wireless HDMI (WHDI) and IR extender solution comprising a wireless audio / video transmitter and a wireless audio / video receiver. Unlike less expensive solutions, the IOGear product does not require line of site between transmitter and receiver, so will work through walls and between floors. The transmitter has two HDMI inputs, an HDMI pass-through output and a 2.5mm IR extender, which can be set to 38KHz, 40KHz or 33KHz. The receiver has a single HDMI output for connection to a display. The product also includes a remote control for switching sources. Both transmitter and receiver contain mini-USB ports. On the transmitter this is labeled “service” so is presumably for firmware upgrades. On the receiver, it is used for power. The product lists for $349 on IOGear’s website, but can be found for $189 on amazon.com. The units are fairly minimalistic; both are housed in plastic cases with just an illuminated power button and button to switch sources. Both units are solid-state devices, so there’s nothing to make noise and they both run very cool, so there should be little concern about heat output. Setup was a breeze: plug the receiver into the display, then power up the transmitter. The on-screen display provides useful feedback about connection status, source number, channel and resolution. The unit can pass HDMI to two TV’s simultaneously: one via the transmitters HDMI pass-through and the second wirelessly. Naturally, when two TV’s are connected to a common transmitter something has to be done to ensure that the signal is compatible with both sets. On expensive matrix switches, this is normally accomplished via scaling, which means significant cost if good quality is to be obtained. IOGear use the displays’ EDID (Extended Display Identification Data) information to determine the capabilities of the attached display and feed the best common set back to the source, so it can send the correct signal. 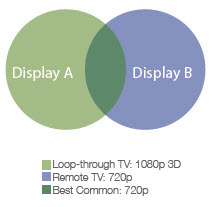 In the diagram above, Display A supports 1080p 3D and Display B supports 720p, so the best common feature set is 720p. The transmitter will report itself as a 720p device to the source and 720p will be delivered to both displays. This does have one slight disadvantage. The EDID information is retained even when the display is turned off. (This is typically done for performance.) So if one of the displays is a lower quality (e.g. 720p) than the other, the higher quality one (e.g. 1080p) will always get a lower quality signal (e.g. 720p instead of 1080p). This can be overcome manually changing the source’s, or by disconnecting one of the displays and power cycling the unit (not terribly convenient). At this price-point, it’s an acceptable situation. With HD TV prices being so low, upgrading a 720p to 1080p display isn’t going to break the bank. My initial test was form a Blu-ray playing via PowerDVD on my laptop, with line of site to the receiver connected to my Pioneer Kuro plasma display. Everything worked well. Next I moved the laptop and transmitter into and adjoining room and repeated the test. The results were still crystal clear picture and sound. Despite this, the picture was still crystal clear form the basement to the first floor. For the final test, I moved the receiver to my bedroom and tested from the transmitter in the basement to my 720p plasma. Once again no issues: just crystal clear picture and sound. I did not test the 3D capabilities, as I have no 3D equipment (nor any interest in 3D) at home. If you’re looking to locate a TV or projector in a place where it would be hard to run cables, or want to connect a TV in another room to you main home theater, the IOGear Wireless HD 3D Digital Kit could be just the ticket. It just worked flawlessly in all of my tests.